At this point, Bill's life takes a downward plunge into a world of alcoholism, unemployment, and homelessness. But an unlikely series of events suddenly sheds a beacon of light on the hopelessness of his life, and he is given a second chance at love and happiness--but only if he rises to the challenge. "For What He Could Become was penned by a recent acquaintance of mine, Jim Misko. I purchased the book as a gesture of solidarity, but I had low expectations of it. Jim, after all, is a realtor, and everyone knows realtors can't write -- they just fill in the blanks. Three days later, I finally put the book down. I had taken it with me everywhere: to bed, into the loo, to the bank so I could read while standing in line, to my last CLE where I concealed it behind the handout as I read (a trick I learned in ninth grade algebra). In the course of those days, I burned a batch of cookies, spaced a dentist appointment, and almost fell down an escalator opening when I was walking with my nose between the pages. The tension in this book is impeccable. Never so lax I wanted to quit reading, never so intense that I skipped to the end to find out what happened. His prose is as spare and powerful as the tundra on a winter day. Somehow Jim has managed to write an entire book without adjectives, and write it convincingly. 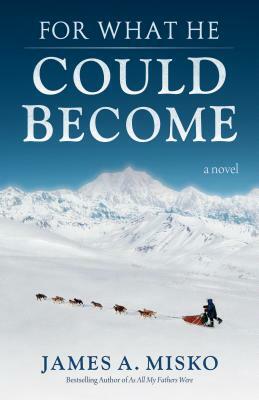 As his protagonist Bill wanders away from Alaska, the characters seem to become more two-dimensional, less individualistic, as if that part of Bill's life is dreamlike, unreal, until he returns to the local color." Stephanie Patel,Esq. "I was not expecting a full blown action and emotion packed transporting reading experience. I could not put it down, and once the race started, did not. When I had finished...I reread it cover to cover. In forty years of fairly steady and broad-based book devouring, I have seldom done that. Misko is in good company: Kipling, Faulkner, and Scott"
"Great Book!!!! Cathy got hold if it first and almost could not put it down. She NEVER reads a book. Then my turn. I didn't like it I LOVED IT. The story was so true to life and what I have seen so many times throughout Alaska. The race part was so perfect that I got cold, was elated, depressed, all the emotions one gets while actually running. It took me out on the trail again. Congratulations."